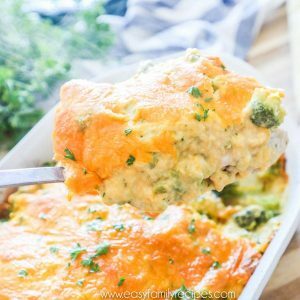 This Chicken Broccoli Cheese Casserole is the perfect dinner for when you want some delicious comfort food. 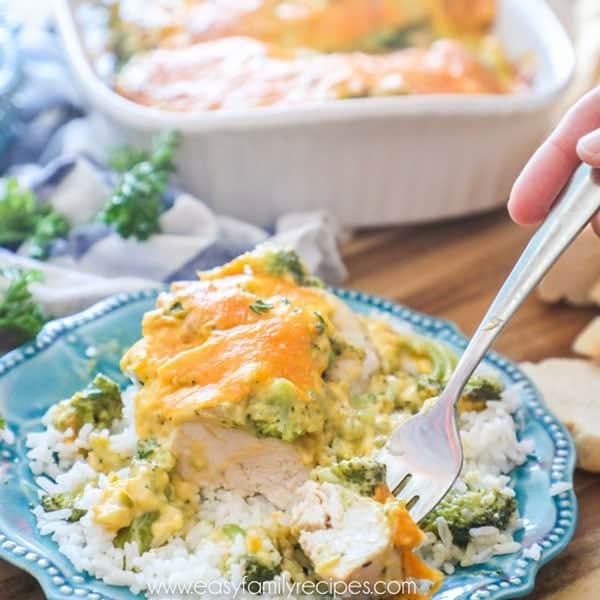 It is loaded with tender chicken, creamy cheddar cheese and wholesome broccoli. With only a few ingredients and one dish, this dinner is super easy to make and cleans up quickly. This is a go to for busy weeknights since the kids love it as much as the adults and can be easily scaled to feed big or small families. 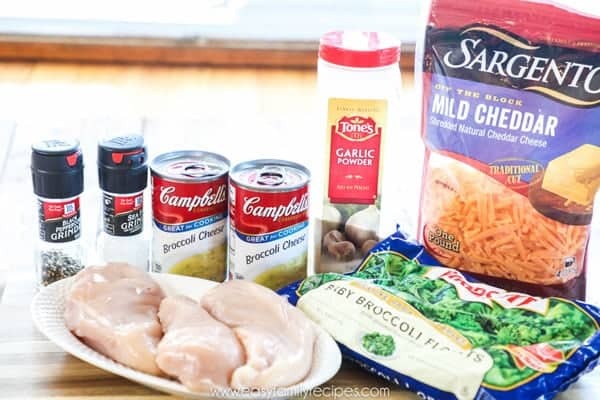 I going to walk through the Chicken Broccoli Cheese Casserole recipe with my tips and pointers to get the best results. Make sure to scroll down to the bottom of the post for the FULL printable recipe card for all of the instructions. 3-4 boneless, skinless chicken breasts- If they are on the thick side, I recommend butterflying so that they are thinner. This will help the dish to cook much faster. Also, 1 serving is generally about 4 oz, which is half a chicken breast, so if you want to cut the chicken in 2-3 pieces so it is easier to serve that is perfectly fine to do at this step. 1 package frozen broccoli florets (12.6 oz), thawed- I like to use the florets over the chopped broccoli so that you get more of the good stuff in there. Make sure that you thaw the broccoli before preparing the casserole or it will drastically increase the cooking time and the chicken might end up tough. If your broccoli isn’t thawed, you can transfer it to a bowl and microwave it for 30 second increments, stirring in between until it is thawed all the way through. 2 cans Campbell’s condensed broccoli cheese soup- You will be using the condensed soup and do not need to dilute it. 1 cup sharp cheddar cheese, shredded- I really like how the flavor of the sharp cheddar marries with this dish, but if you are in a pinch, mild cheddar or mexican cheese blend will work too. I have just a few notes and tips for you on the instructions for this recipe. First, this recipe is packed with a lot of deliciousness, but that means that it does take a bit of time to get it cooked all the way through. There are a couple of things you can do to make sure you don’t have to cook this forever to get it done. Make sure that your chicken is not too thick. If you feel like your chicken is on the thicker side, you can butterfly it (cut it in half so that it is half the thickness it was.) You will end up with more pieces of chicken than here but it will work out perfectly because you will have more flavor per bite and not have to cook it as long. The other thing to keep in mind is that you really do need a large baking dish for this. The tighter all of this is packed in the dish, the longer it takes to cook. So make sure that you have a large dish so that your chicken can all lay flat. Another question I get a lot on making my chicken recipes are if they need to bake covered. I bake all of my chicken casseroles on the middle rack of the oven and I do not cover them. I like to leave them uncovered because it helps the additional liquid released by the food during cooking to evaporate so that your meal doesn’t end up soupy. Each oven cooks differently and climate and altitude also play a role in how your dish will cook. My advice is to keep an eye on the Chicken Broccoli Cheese Casserole while it is baking and if the top starts to get more browned than you want, at that point loosely cover it with a piece of foil so that it can continue to bake until done without getting to brown. 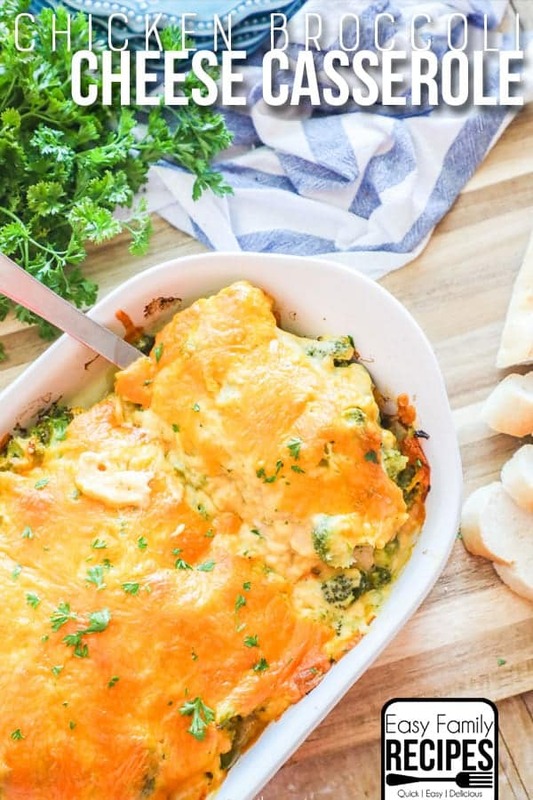 In the end your Chicken Broccoli Cheese Casserole should have perfectly cooked, tender chicken swimming in creamy cheese sauce with those perfect little broccoli bites all throughout. I hope this easy recipe is as loved by your family as it is by mine. If you do get a chance to try it and enjoy it, I would love to hear about it! Nothing makes me happier than hearing others make and love the recipes I share. You can leave a comment below or if you share a photo on Instagram, make sure and tag me @easyfamilyrecipes so I can see your creations! One last thing before I go… If you are like me and feel like you need a regular stream of recipe inspiration, I would love it if you signed up to get the Easy Family Recipes email newsletter where I share what I am cooking and some new recipes that I have loved. You can sign up here or by clicking the button below. Lay the chicken breasts flat in a large baking dish. Sprinkle the garlic powder, salt and pepper over the chicken breasts to season them, then spread the broccoli florets on top. Pour the broccoli cheese soup over the broccoli and chicken so that it is evenly covered and then top with the shredded cheddar cheese. Garnish with parsley and serve over rice, mashed potatoes or your with your favorite side! Store leftovers in an airtight container in the refrigerator for 3-4 days, or in the freezer for up to a months. I made this and it was wonderful! I did use different soup, I did not have broccoli and cheese, so I used a combo of cream of mushroom and cream of chicken. My husband even liked it! Can you use fresh broccoli instead of frozen broccoli? Can I make this and freezer it for later instead of cooking it right away? Prepare it as a freezer meal? So glad to find this recipe. Made this years ago but it was called “Chicken, cheese, and trees.” My kids loved it.I definitely will be making this. I found it very , very bland. I agree it was bland to me also!!! I made this tonight. It was a hit. The only thing I changed was I used 1 can broccoli cheese progreso soup. What else are people using Instead of the cheese soup as I can’t get it in the uk? You could use precooked chicken and just mix the sauce in. I would recommend cooking it for 25-30 minutes or until everything is heated through and the sauce bubbles around the edges.